New York – U.S. President Donald Trump on Wednesday signed directives to build a wall along the U.S. border with Mexico and crack down on U.S. cities that shield illegal immigrants. Trump, at the signing ceremony, said he would proceed quickly on sweeping plans to curb immigration and boost national security, according to Reuters. The steps in the coming days include executive orders restricting refugees and blocking the issuing of visas to people from several Middle Eastern and North African countries including Syria, Sudan, Somalia, Iraq, Iran, Libya and Yemen. Trump signed the two executive orders at the Department of Homeland Security, one of them ordering construction of a wall along the roughly 3,200-kilometres U.S.-Mexico border. The other order moves to strip Federal grant money from “sanctuary” states and cities, often governed by Democrats, which harbour illegal immigrants. In an interview with ABC News on Wednesday, Trump said construction on the wall would start within months, with planning starting immediately, and that Mexico would pay back to the U.S. “100 percent” of the costs. 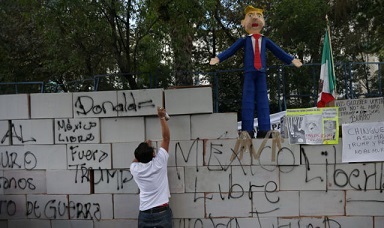 Mexican officials have said they would not pay for the wall. During a White House briefing, Spicer referred to the wall as “a large physical barrier on the southern border”. “Building this barrier is more than just a campaign promise, it’s a common sense first step to really securing our porous border. “This will stem the flow of drugs, crime, illegal immigration into the United States,” Spicer said. Trump has long said that he will make Mexico pay for the wall. “We’ll be reimbursed at a later date from whatever transaction we make from Mexico. “I’m just telling you there will be a payment. It will be in a form, perhaps a complicated form. What I’m doing is good for the United States. “It’s also going to be good for Mexico. We want to have a very stable, very solid Mexico,” Trump told ABC on Wednesday. Trump made cracking down on illegal immigration a key element of his presidential campaign, with supporters often chanting “Build the wall,” during his rallies. The cost, nature and extent of the wall remain unclear. Trump last year put the cost at “probably eight billion dollars”, although other estimates are higher, and said the wall would span 1,600 kilometres because of the terrain of the border. His plans prompted an immediate outcry from immigrant advocates who said Trump was jeopardising the rights and freedoms of millions of people.